Humans have long been burrowing underground as protection against intruders and elements, and in the modern home, a cozy basement has an archetypal appeal to this very instinct. But the major drawback to basement living is that this space can be cold, drafty, and not very appealing to anyone seeking a burrow on a cold winter's night. A basement that can be refreshingly cool on a hot summer day can chill you to the bone when the weather is cold. In many homes, a basement that is otherwise nicely finished still remains largely unused unless it can be made warm enough. Basements are the logical place to expand additional living space. Considerable effort and money go into making basements warmer and less drafty, yet all too often these solutions don't entirely fix the problem. The solutions most commonly recommended for warming up a basement are to insulate the below-grade walls, raise the subfloor above the slab, and add heating—either through installing radiant heat floors or making revisions to the main HVAC ductwork system. To be usable, most basements need to have some source of active heating. Radiant-heat floors are great, but they are also quite expensive to install. For an electric radiant-heat floor, you can expect to pay upwards of $12 per square foot to have it installed, and you shouldn't be surprised to see your annual electrical bill jump by several hundred dollars. For hydroponic systems that operate by circulating tubes of warmed water beneath the floor, annual operation costs are less expensive, but installation can easily cost you $15,000 to $20,000. In most cases, the better solution to the heating issue will be to make modifications to your home's existing HVAC ductwork system to extend it to the basement areas. This isn't a cheap proposition, but it is considerably more affordable than most of the alternatives—provided your home's furnace has sufficient capacity to handle the extra heating load. The second common approach to remedy a cold basement is to insulate the walls and floors. On walls, this is normally done by furring out the concrete block walls with studs, filling the stud cavities with insulation, then finishing off the walls with drywall or paneling. Floors are often treated in a similar fashion, adding a new subfloor above sleeper strips, onto which the flooring is laid. Although these steps may be necessary to convert a basement to comfortable living space, many homeowners expect this type of insulation to do the trick, and they are disappointed when it isn't successful. Although insulating walls have a striking impact on reducing heat loss in upstairs walls, it doesn't seem to have the same impact on below-grade walls. This is because the earth itself already does a good job of regulating basement temperatures. There is a reason why settlers on the prairie plains in the 1800s dug their homes down into the earth—it offered good insulating value against the cold winds of the prairie. In the modern residential basement, the primary source of cold is not heat loss through the below-grade walls and floor. Instead, address your attention up high—at the short section of the foundation walls that are exposed above the earth, and overhead to the rooms and framed walls that are above-grade. If you already have finished basement walls and ceilings, ripping them out to insulate them does not make sense from a cost/benefit point-of-view. Your energy cost savings will never overtake the cost to make these improvements. Instead, there are some other strategies you can take that will greatly help reduce draftiness and heat loss in your basement. Virtually all the coldness in a basement originates in air drafts and heat loss taking place up high—at or above ground level. Ground-level cold is the real culprit. It cascades into your basement through windows, ducts, vents, pipes, spaces around intrusions, the rim joist, header joist, and non-conditioned rooms. If you fix these on-grade sources of cold and you will address most of the cold-air entry points into your basement—all without ripping out floors or walls. Systematically inspect and evaluate the various areas of your home as directed below, and make whatever repairs are indicated. If you are finishing your basement, viewing the interior with a thermal image camera or thermal detector is not just recommended—it is practically required. Thermal imaging cameras are no longer just for house inspectors and energy auditors. Cheap but very effective cameras can be purchased for less than $200—a modest investment since this tool will have lots of applications around the house. Or, you can lease a camera from a tool rental center. With a thermal camera, simply standing in the center of a room and viewing the various areas through the viewfinder will pinpoint where your energy losses are occurring. There are also even cheaper thermal detectors available. These require little more than moving around the room to detect spots where energy loss is occurring. Fall and winter the best times to finish your basement, at least from an energy-control standpoint. This is the time when temperature spikes are at their greatest and will be more visible on the thermal camera. Your house's non-insulated rim joists and headers are probably the biggest offenders when it comes to heat loss. The headers and rim joists are the outer framing members of the floor platform that rests on the concrete foundation. While the vertical walls that sit atop the flooring are themselves insulated, the spaces below the walls are not, and where these rim joists and headers are exposed to the outside air, enormous heat loss can occur. In older homes, these basement joist spaces are left "as is" and are rarely insulated. To insulate these spaces, cut 1 1/2-inch-thick pieces of extruded foam insulation, insert them into the joist spaces against the outer rim joists and headers, and seal the gaps around the foam with a spray foam sealant, such as Great Stuff. Alternately, pieces of fiberglass batt insulation can be loosely rolled up and stuffed into the joist cavities against the header. Ducts are unimpeded "freeways" that shoot cold air straight into your basement. Dryer and bathroom fan ducts are little more than tubes of thin aluminum or paper-thin plastic, and they provide zero insulation from the cold. Replace such ducts with inexpensive insulated ducts or wrap your existing metal ducts with insulation. Most vents (the flap-like fitting where the duct leaves the house) are terrible at preventing cold air from migrating into your house. Little more than a thin plastic door, these vents let cold air pour into the duct, and thus into your house. Replace your cheap, ineffective vent flap with an energy saving "floating shuttle" type of vent flap. Exterior basement walls that have earth mounded up against them do a fairly good job of preventing the cold from coming into the basement. Earth, after all, is a good natural insulator. But basement walls that are not protected by earth—such as those found in walk-out basements—are just as susceptible to cold migration as walls elsewhere in the house. Exposed concrete walls should be insulated with extruded foam. 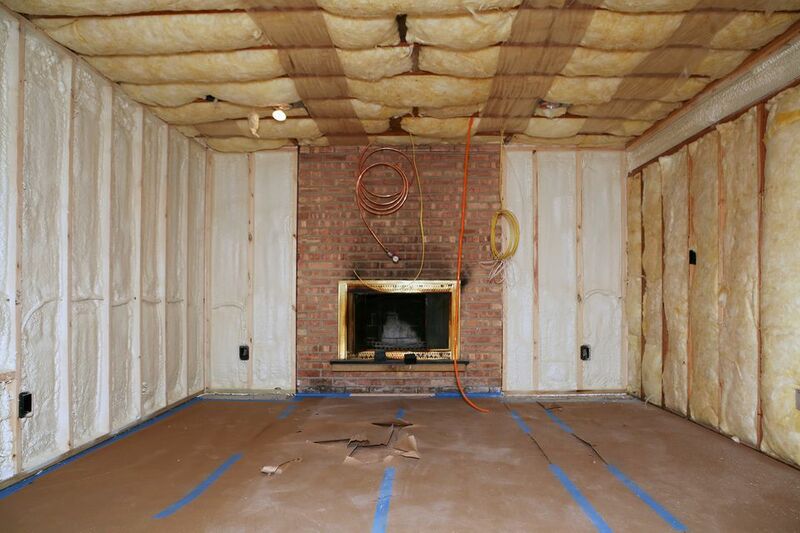 Wood-framed basement walls can be insulated with fiberglass batt insulation. If you remember your basic science, you know that cold air descends. If the walls on the first story above the basement are not insulated, they can act as conduits for cold air to move down towards the basement. Insulating an entire level's worth of walls just to cure basement cold is probably not cost-efficient, though it might well pay off when you consider the overall energy costs and comfort of your home. But if you are looking to identify where cold air is entering your basement, remember that the cause may not be in the basement at all. Rare is the basement that has no functional services, such as a furnace, water heater, and washer and dryer. Unless you have a special need for these items to be heated, it is relatively easy to erect insulated interior walls that block them off, preserving heat for the basement areas that are inhabited. Make sure to allow for the necessary ventilation space when enclosing utilities. Some high-efficiency furnaces draw their combustion air from the room space surrounding the furnace, and it's important not to impede this air source. Generally, though, if you can confine the furnace, water heater, washer, and dryer in a single unheated room, it makes it easier to control the temperature in other parts of the basement. Rooms on the ground level that are not heated will compromise your efforts to heat the basement below. Some homes may have basement spaces below unheated porches or garages. Insulating the basement ceiling below these spaces will hold in the heat, preventing it from migrating to the unheated space above. Adding heat sources is wasteful if it's the only method of keeping your basement warm, and if you haven't taken the practical measures necessary to block drafts and stop heat loss. Upper levels of your home benefit from passive heat sources, chiefly solar heat gain through window glass. But basements do not have this benefit, so some supplemental heating is usually needed. The best, most economical means of adding heat to a basement is to extend or modify the HVAC system already supplying heat to the rest of your home. An HVAC contractor can do this work fairly efficiently while remodeling is in progress, but it will cost more to make these changes in a basement that is already finished. Where this is not practical, a basement can often be effectively heated with some modest electric baseboard heating units or even portable space heaters. Make sure, though, that the heat-loss solutions described above have been followed before installing supplemental heat.